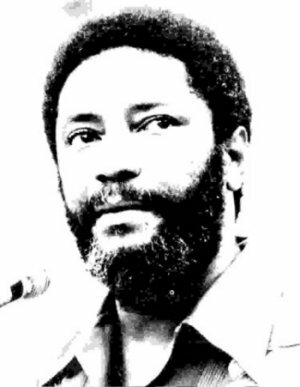 On this date in 1983, Grenadian Prime Minister Maurice Bishop was shot with seven supporters during the chaotic struggle of power that precipitated a U.S. invasion. The charismatic Bishop grew up on the small British Commonwealth island in the south Caribbean, attended the London School of Economics, and became the leader of the Marxist New Jewel Movement. In 1979, Bishop and the NJM overthrew the paranormal government of Eric Gairy (he’s famous for his controversial judging in the wild 1970 Miss World pageant). Leftist governments in the hemisphere were just the sort of thing to irk the Yankee hegemon. Collaboration with Cuba and Nicaragua to build an airstrip on Grenada … could that open the door for Soviet air support when the Sandinistas invaded Harlingen, Texas? Ironically, it would be an intra-party Communist coup against the fellow-Communist Bishop that provided the pretext for said hegemon to stanch this existential threat. A deputy, one Bernard Coard, ousted Bishop in October 1983, apparently a factional dispute in the NJM along ideological lines. Bishop broke out of house arrest and led a march on Coard’s position on this date, contesting his control of the government; the march was broken up and its leadership collared — and, later that day, disposed of. The Reagan administration didn’t care two figs about Maurice Bishop, but a scene of general chaos offered it all the pretext necessary* to invade on Oct. 25. To save from the red menace, oh, let’s say, a few American med students, plus a little thing called the free world. Years later, that provocative airstrip bears Maurice Bishop’s name. Audio of several Bishop speeches can be had here; others can be found on YouTube. * Another possible precipitating factor: a U.S. Marines barracks in Lebanon was spectacularly bombed by terrorists on Oct. 23, 1983, forcing (eventually) American withdrawal. The New Jewel Movement turned out to be an opponent more in Washington’s wheelhouse.